The latest game to be targeted by an engulfing circle of hatred is Fallout 76, launched a few weeks ago by Bethesda. Beyond the game’s current issues, of which I’ll talk extensively in a bit, the replacement of the Power Armor Edition’s canvas bag with a cheaper nylon bag riled up pretty much everyone on the Web and rightfully so. This was an inexcusable move and every owner of a Fallout 76 Power Armor Edition should be eligible for a full refund. However, it is important to keep this problem separate from the game itself – after all, this was the doing of the publisher (Bethesda Softworks), not the developer (Bethesda Game Studios), which works on the game and certainly doesn’t have any say on the contents of a collector’s edition box. Let’s talk about the game, then. Since its surprise announcement at Bethesda’s E3 2018 press conference, it was met with severe skepticism by Fallout and BGS fans simply because it wasn’t the same single player RPG experience the studio has always released since its foundation. As if developers weren’t allowed to do anything but make the same types of games over and over again, which, ironically, VP of Marketing Pete Hines already hinted at a couple years ago when he said the studio was no vending machine. The usual parade of clickbait videos (and articles) appeared on the Web ranting against Bethesda, with some of them even going as far as calling out the publisher for its previous plea to the industry to save single player games. Of course, the fact that they also announced not one but two big single player games during the same conference, the new IP Starfield and The Elder Scrolls VI, somehow flew under the radar because it didn’t fit the narrative. At that point, the hate machine was already in motion and in 2018, with today’s interconnectivity, it’s a near-unstoppable force. Seemingly with each passing year, the stories of outraged gamers get louder and wider all over the Web. In some cases they are entirely justified, in others massively overblown. I am of the opinion that the almost unprecedented negative backlash Fallout 76 is getting is far closer to the latter case than the former. That is not to say the current state of the game doesn’t have many flaws, because it clearly does. At the same time, the aforementioned circle of hatred, sparked many months before anyone even had the chance to play the game, fostered a cloud of negativity surrounding Fallout 76 that certainly impacted the undeservedly low reception it got at launch. There are problems that need to be fixed in Fallout 76, that’s for sure. But they are nothing we haven’t seen before upon the release of a big online game. Unfortunately, gamers tend to have very short memories and may need a refresher from time to time. Let’s begin with a little game called Diablo III. Possibly the most anticipated PC game at the time, it launched in May 2012 and was practically unplayable for millions of customers for days as Error 37 became forever infamous for preventing access to the servers. 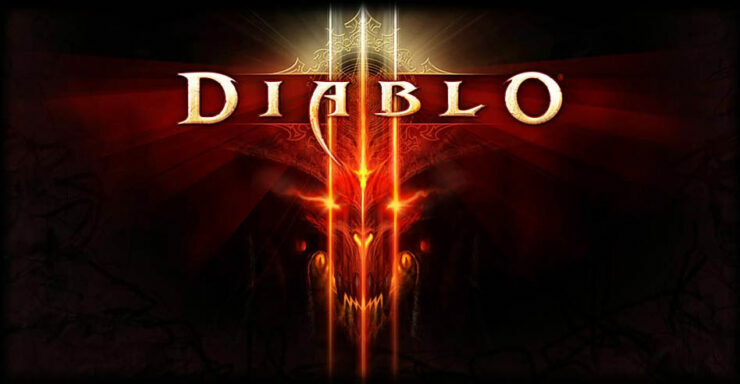 Diablo III was not only roasted for being online-only, which meant people weren’t able to play at all while the server issues continued, but also because several fans felt it was a letdown compared to its predecessor, Diablo II. Over time, though, the online connectivity issues were resolved and Blizzard steadily improved the game through content patches and expansions, to the point where six years later Diablo III is still being happily played by millions of fans and it just got a new home on the Nintendo Switch console. Then there’s Final Fantasy XIV. Based on another massive IP with a huge fanbase, its launch in 2010 was so much of a disaster that Square Enix had to close it down while a massive overhaul project culminated with A Realm Reborn. Now, Final Fantasy XIV is one of the most appreciated MMORPGs on the market right next to Elder Scrolls Online, another exemplary case for this analysis. Developed by Zenimax Online, a new studio founded precisely to make this game, it was also criticized from the very start for being a big departure from previous Elder Scrolls installments. When it launched on PC, Elder Scrolls Online received mixed reviews, too, due to bugs and other problems. The developers stuck with it, though, and continuously delivered fixes and new content until it became one of the best games in the genre. The list could go on and on. No Man’s Sky, a game which notoriously launched with several key missing features that had been promised (unlike Fallout 76), turned the ship around in about two years and now enjoys a much more positive vibe. Warframe, now widely believed to be one of the best free-to-play games on the market, was a mess when it launched and reviews were similarly far from favorable. Over time, it turned into a huge success. Even the new breed of MMO-lite titles like Destiny 2 or The Division isn’t exempt either. Both games were basically pronounced dead not too long after they released, only to make a sumptuous comeback within a year or thereabouts. There’s really no reason the same cannot happen with Fallout 76. The potential is certainly there, once the bulk of technical issues has been resolved. Bethesda Game Studios actually did several things right with the game, striking a nice balance between a multiplayer online roleplaying game and the survival/building elements that were expanded from Fallout 4. There’s a solid gameplay loop already in place, requiring players to get out there to replenish resources but not too often that it becomes a nuisance. Furthermore, unlike practically every survival game, the mega server structure doesn’t require you to create different characters every time you want to visit a friend on a different server, allowing a far more seamless experience. The lamented lack of human NPCs, announced from the very beginning, is a good fit for the earliest game in the Fallout timeline, set only twenty-five years after the nuclear bombs fell all over. If anything, exploring the wasteland by yourself enhances the inherent dread that a post-apocalyptic world should convey to the player. And it’s a world well worth touring. 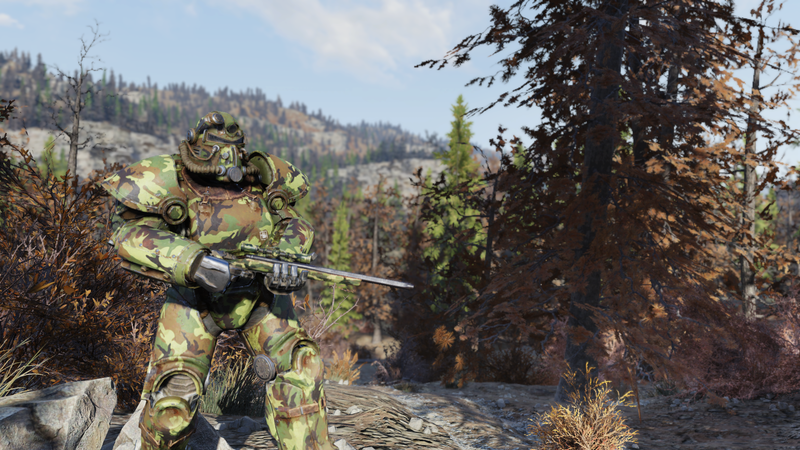 West Virginia feels distinctly different than any region previously seen in other Fallout titles. Its map is huge and filled with some great environmental storytelling if you stop for a second to read and listen to the countless notes and holotapes dispersed through each area of the game. 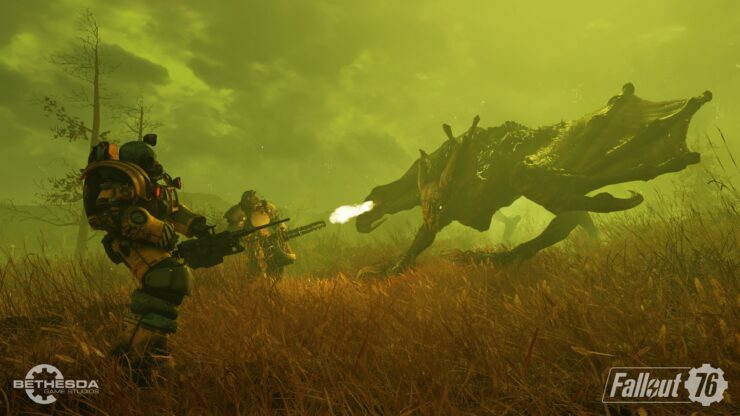 The fairly rare encounters with other players, much maligned before Fallout 76 released, are nothing but a pleasant surprise. Thanks to the rules implemented, the potential for griefing is minimal and players are instead extremely helpful to one another. Of course, there’s a long road ahead full of polishing and tweaking. Now it’s up to Bethesda to listen to the community, as the creators of the games mentioned above did, in order to properly prioritize fixes and additions. The message they relayed to the community last week outlining the roadmap of updates for December is a step in the right direction. Should they play all their cards right, including the introduction of official mod support and private servers (tentatively scheduled for late 2019), it’s a safe bet that Fallout 76 will turn into yet another comeback story in twelve to eighteen months from now. Would it have been a better experience if there was a proper, old-school beta spanning several months? Without the shred of a doubt. But the same could be said about any other game released in the past five years or so, given that beta tests have become merely marketing demos. And besides, as old-timer MMORPG fans know all too well, online games were often a mess at launch even when developers used to host large and lengthy pre-release tests. It’s the nature of the beast, as it were.